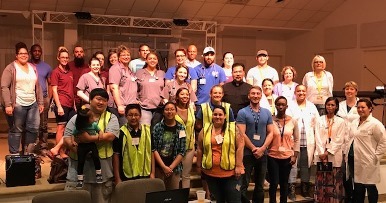 Students from several academic programs at South University, Virginia Beach recently teamed up to assist at a health clinic for the area’s homeless. The clinic was sponsored by the mobile health clinic Meraki Health and Wellness and Beach Fellowship Church. The night before the temporary clinic opened Doctor of Ministry students from the campus worked alongside other volunteers to turn the church’s worship area into a multi-station working medical clinic. Dr. A. Blanco-Knezovich, DNP, FNP-C South University, Virginia Beach Clinical Coordinator for the Master of Science in Nursing-Family Nurse Practitioner (MSN-FNP) program synchronized the medical clinic and event participants, and South University College of Business student Andrew Knezovich supervised clinic operations. On the day of the clinic South University students and faculty worked together to provide competent and compassionate care. The Bachelor of Science in Legal Studies program director registered, assigned, and reviewed clinic duties to volunteers. Bachelor of Science in Healthcare Management students assisted with patient registration and chart movement throughout the clinic. Bachelor of Science in Nursing students completed patient intakes, obtained vitals, and reviewed discharge instructions. MSN-FNP students conducted evaluations, initiated treatments, and prescribed medications for patient’s acute and chronic medical issues. Associate of Science in Occupational Therapy Assistant students dispensed hygiene kits they created from their hygiene drive efforts on campus, and worked in conjunction with the clothing ministry to organize weather -appropriate clothing. Students were also given the opportunity to volunteer alongside many of the other organizations on hand for the event, participating in a wide-range of opportunities for service and assistance.